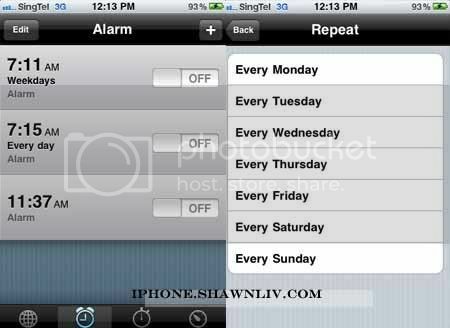 I think many iPhone’s users were aware that iPhone‘s alarm clock app is not working in the year 2011. This happen to me on Saturday 1 Jan 2011. Lucky, I still manage to wake up on time for the date. To temporary solve the problem. We need to update Repeat to Every Day or Weekday (Monday, Tuesday Wed ….) or certain day as shown above. After that, it work fine. You may try this as temporary solution for this moment.